My parents owned a donut shop in Lodi way, way back in the day, so donuts have always had a special place in my heart. A few Christmases ago, my sister got me donut pans so I could carry on the “family tradition” of making donuts. 😉 I also think that she was hoping to be a taste-tester! 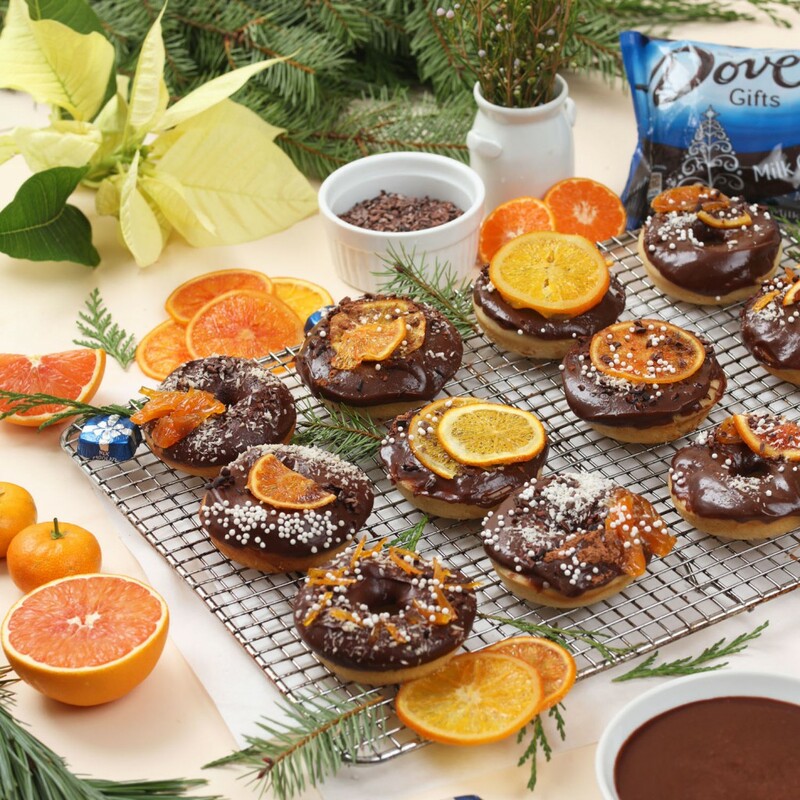 I wanted to make a batch of donuts for her this holiday, so as part of my partnership with DOVE® Chocolate, I came up with this donut recipe inspired by seasonal citrus and Silky Smooth DOVE Milk Chocolate PROMISES. 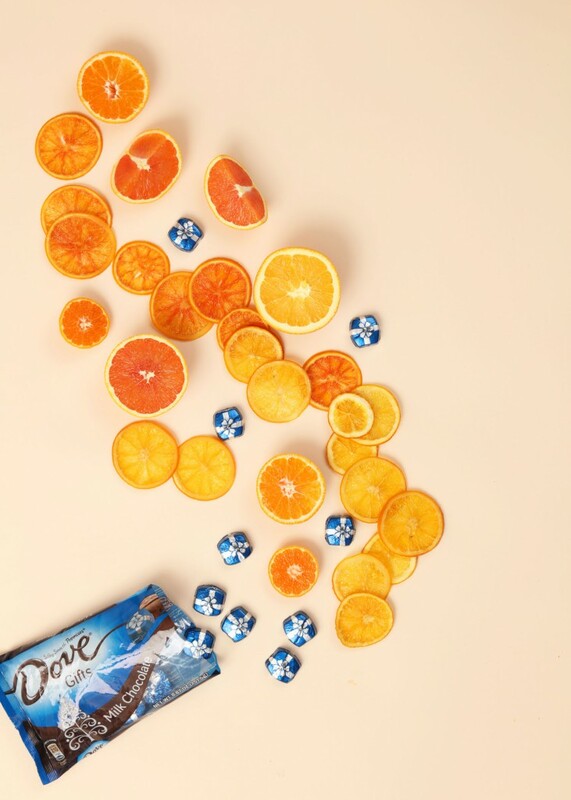 Orange and chocolate just go together so well! 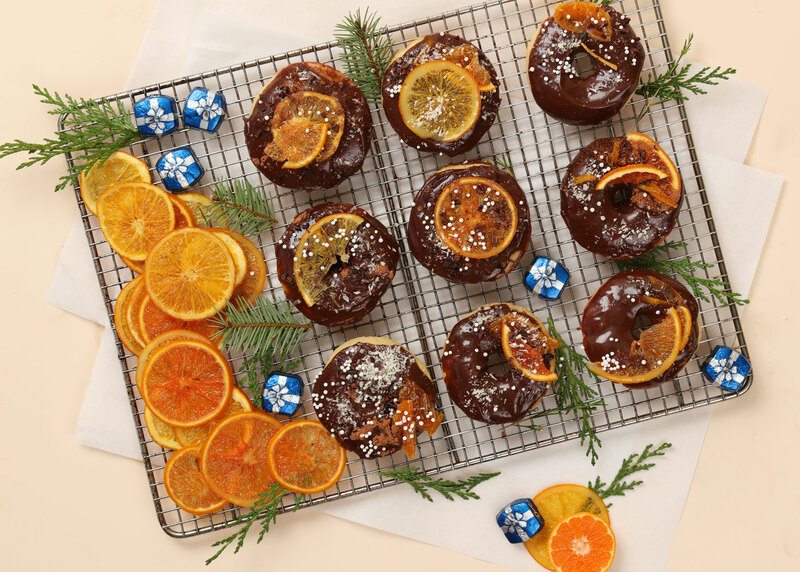 The dough of the donut is subtly flavored with orange zest and orange extract. 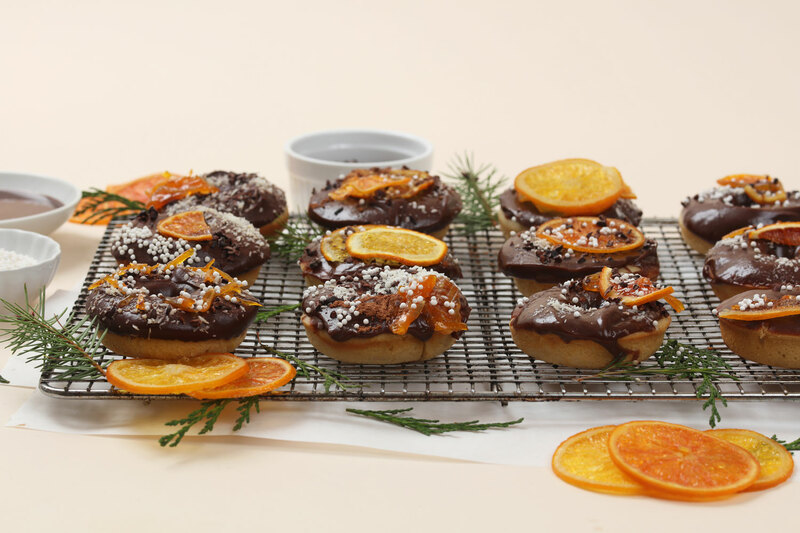 I topped the donuts with a milk chocolate glaze, cacao nibs and powder, coconut, sprinkles and candied cara cara and orange. I won’t be making it to Northern California to see my family this Christmas, but my sister will be coming to see me (AKA Owen) right before Christmas, so I’ll get to share a few donuts with her then! This year, for Owen’s very first Christmas, we’ll be heading to Kansas to hang out with Brock’s family. Owen did a pretty good job on our flight to NY a few months back, so I’m hoping it doesn’t phase him again. I’m looking forward to Owen meeting all his cousins, aunts and uncles and the tornadoes of energy they’ll be kicking up. But before we plunge into all that craziness, I’m going to do a little self-care. It’s so important to take a break and indulge yourself. I always feel my best when I take a little me time. For me, that means taking a luxurious bath with salts and essential oils and baking or cooking something, because that’s my therapy. It’s the little things! Tell me, how do you #ChoosePleasure and focus on yourself during this busy time of year? For the candied citrus: Slice citrus into thin rounds. Bring water to a boil over medium heat and add sugar. Stir until sugar is dissolved. Add citrus. Lower heat and simmer until rinds are translucent. Add more water if necessary. Drain and let citrus dry overnight. For the donuts: Preheat oven to 425 degrees. In a mixer, beat oil and sugars on medium speed. Mix in eggs. Add baking soda, baking powder, salt, orange zest and extract. Add milk. Slowly add flour 1/2 cup at a time until incorporated. Pipe batter into a greased donut pan. Bake 10 mins. For chocolate glaze: Over a double boiler, melt DOVE Milk Chocolate PROMISES and butter. Add salt, orange extract and corn syrup. Stir until glossy and smooth. 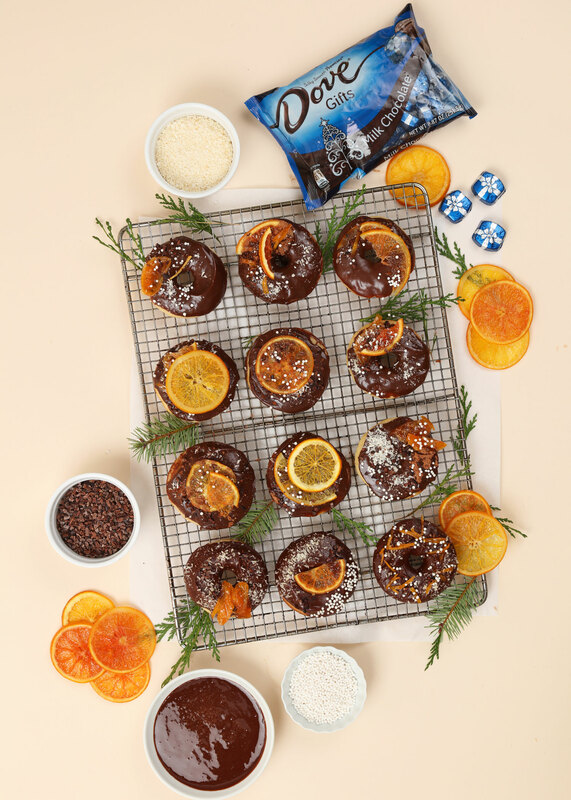 To assemble: Dip donuts in chocolate glaze. 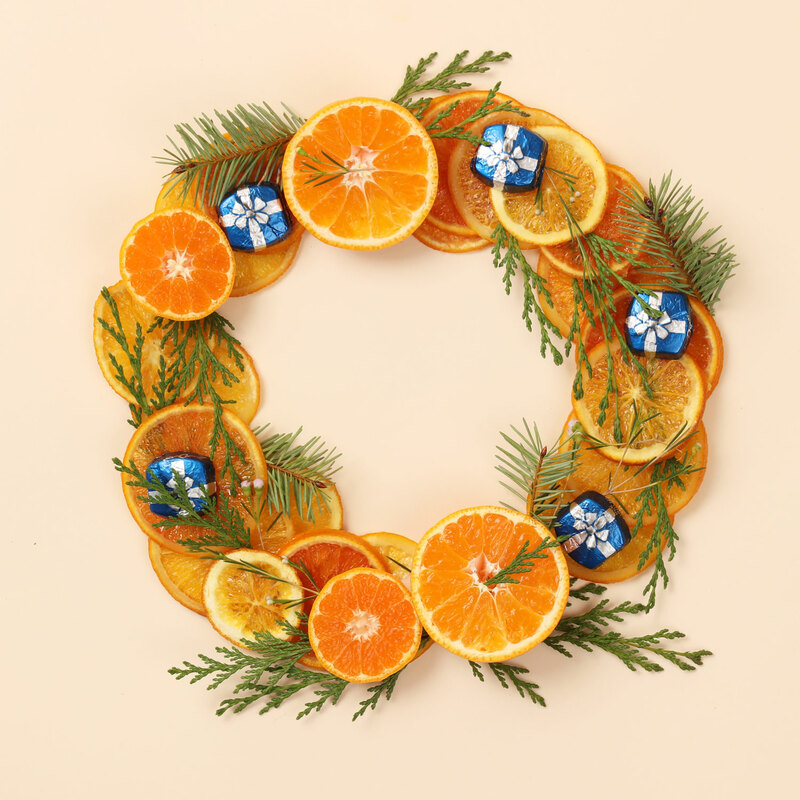 Garnish with candied citrus pieces, coconut shreds, cacao nibs, and sprinkles. **This post is brought to you in partnership with DOVE Chocolate though all thoughts and opinions are my own. Thank you for supporting our sponsors that help keep our content inspired.